With the generous use of my brother’s Glowforge, I was able to fabricate three paint racks for my workspace. Two of them are general purpose racks, designed to hold paint bottles from various manufacturers in an upright position for easy identification. 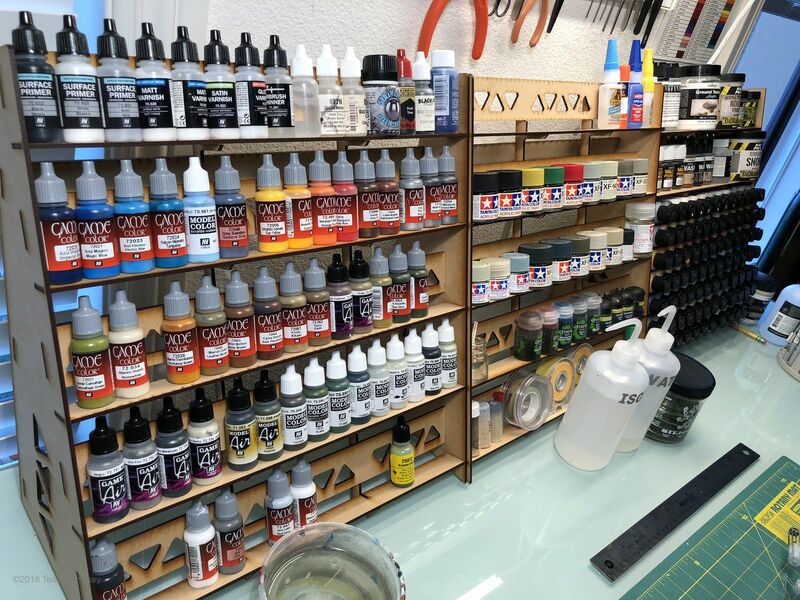 The third rack is designed around holding the full set of Badger Minitaire airbrush paints. I have to say that these paint racks have completely overhauled my workspace. 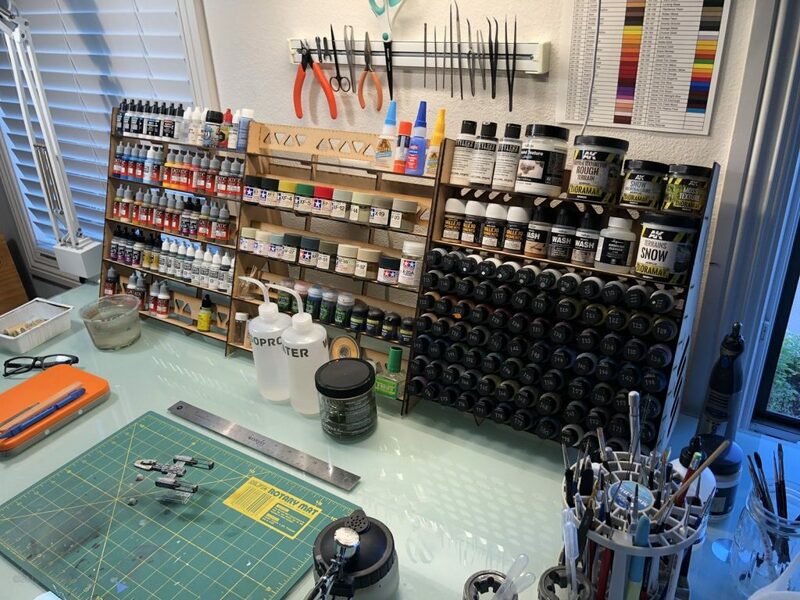 Before, I had random bottles all over the table, some in a Vallejo paint stand that didn’t come close to holding my paints and more stored in boxes underneath the desk. Having everything easily visible within easy reach has eliminated my hunting around the table for paint. I also don’t feel like I’m playing pegboard every time I have to rearrange some paint bottles in the little circular cutouts of the Vallejo paint stand. 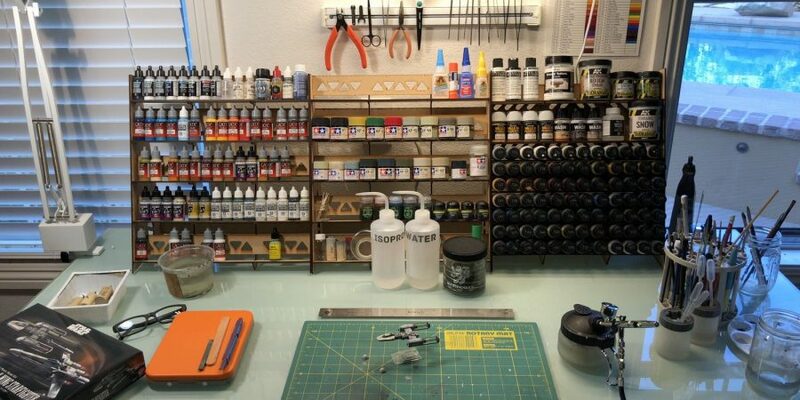 Most of the bottles of Tamiya paint in the center rack are from the late 1980s! These have sat in a utility box for the last 30 years until I recently dusted them off with my return to the hobby. Amazingly, adding a little X-20A Thinner and a ball bearing to mix up the paint resulted in paint that shot perfectly well through my airbrush! 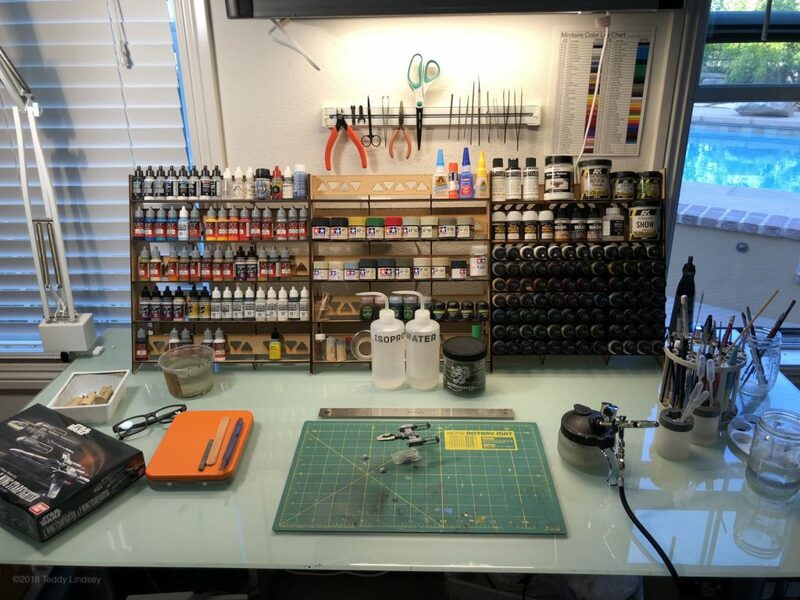 My newest paint rack design is focused on holding a complete set of Badger Minitaire airbrush paints. I generally look up the Minitaire paints by a color chart and I have labeled the top of each bottle with the chart’s numeric ID. I designed the new rack to hold the entire range of 84 bottles in a horizontal position to make the ID number easy to read. Additionally, there are two shelves atop the Minitaire-specific shelves that can hold vertically oriented bottles. I’m really happy with how these turned out. The racks are surprisingly sturdy and with each shelf having two support spines, there is zero flex in any of the shelves even when fully loaded. Very nice. I’m looking for a design like that for myself. I assume you can airbrush the wood to bring out a different colour? Thanks, David! The parts are cut from MDF board which actually soaks up paint like crazy and can warp if it gets too moist. I’ve experimented with coating a test piece with a shellac-based primer/sealer which gave me good results but I haven’t had a chance to paint an entire rack yet.